Update, February 11, 9:35 a.m. EST: According to an e-mail from Petty Officer 3rd Class Richard Brahm of the U.S. Coast Guard, the Coast Guard Cutter Vigorous arrived on the scene last night at 12:45 a.m. EST. As of 6 a.m. this morning, Carnival Triumph's freshwater system is back up and operational. Additionally, the sewage system has been restored to the forward section of the ship but is still down in the aft portion. Onboard engineers are continuing to work on the aft sewage system. Also, Carnival Elation left at midnight, but Carnival Legend is en-route from Tampa and will arrive on the scene near 3 p.m. this afternoon to complete a transfer of food and water. 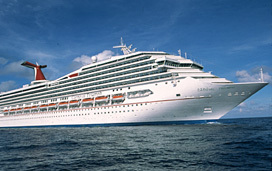 Carnival Legend will also accept a transfer of a patient in need of dialysis and transport her to Cozumel. The Coast Guard will update the situation at 10 a.m. EST. Update, 7:30 p.m. EST: According to a statement from Carnival, a tugboat is "en route to [Carnival Triumph's] location and will tow the vessel to Progreso, Mexico, which is the closest port ... This will enable us to disembark guests and get them home as quickly as possible. The ship is expected to arrive in Progreso Wednesday afternoon and guests will be flown from there back to the U.S."
Carnival says another ship in its fleet, Carnival Elation, is currently on the scene and transferring additional food and beverage provisions to the Carnival Triumph. Cruise Critic member Clinty76, who says his wife and mother-in-law are onboard, posted this note from his wife on the message boards: "We are about to get supplies from another cruise ship and apparently the tug boats should be here tomorrow around noon ... We have no power AT ALL, which means we can't use the toilets, wash our hands, or take a shower." Another member, jgomila198101, said that her sister called and relayed the following: "They have plenty of food. They are all fine, but doesn't look like they will be back until Wednesday night. Said they are still having fun and gave me the task to call her boss who seems to think I was lying LOL. OH WELL glad they are enjoying the extended vacation." We've reached out to Carnival for specifics on the what can and cannot be operated on emergency power. (6 p.m. EST) -- Carnival Triumph suffered an engine room fire Sunday morning that's left the ship adrift 150 miles off the coast of the Yucatan Peninsula. According to a statement from the line, "the ship's automatic fire extinguishing systems activated and the fire was contained to the aft engine room, and the fire fully extinguished." No casualties or injuries have been reported, but the 2,758-passenger vessel is without propulsion. "The ship's technical crew is continuing to assess the damage and attempting to restore power," said the line in the statement. "In the meantime, a tugboat is being dispatched to the ship's location in the event it is needed." All appropriate authorities, including U.S. Coast Guard, have been notified. According to Carnival, there are 3,143 passengers and 1,086 crew on the ship, which left Thursday from Galveston on a four-night Western Caribbean cruise. All passengers have been asked to remain in Triumph's public areas and open decks. They are being provided with food and refreshments. Passengers on the current voyage will receive a full refund inclusive of gratuities and any transportation expenses. In addition, they will receive a future cruise credit equal to the amount paid for this voyage, as well as reimbursement of all shipboard purchases during the voyage, with the exception of gift shop and casino charges. Carnival Triumph's next two cruises, scheduled to depart Monday, February 11, and Saturday, February 16, are being cancelled. Passengers scheduled to sail on either of those voyages will receive a full refund, reimbursement for non-refundable travel expenses and a 25 percent discount on a future three to five-day cruise. Carnival says it is contact with impacted passengers to advise them of the situation. On November 8, 2010, fire tore through the engine room of Carnival Splendor, leaving the vessel powerless and adrift off the west coast of Mexico. Passengers went without working toilets and hot food, and Splendor was towed into San Diego on November 11, almost four days later. The ship was sidelined for more than three months for repairs. Several Cruise Critic readers, including Clinty76, whose wife and mother-and-law are onboard, tipped us off to the news.